HeartShare honored Melinda Katz, Eric Ulrich and Dianne Cattrano as Children’s Champions at its 29th Annual Education Services Dinner Dance on Thurs, May 31, 2018. (left to right) Linda Tempel, Executive Director of HeartShare Developmental Disabilities Services, Eric Ulrich, NYC Council Member, Melinda Katz, Queens Borough President, Dianne Cattrano, Director of HeartShare’s Cuomo First Step Pre-School, David Weprin, NYS Assembly Member, and Carol Verdi, Senior Vice President of HeartShare Education Services. Queens Borough President Melinda Katz and NYC Council Member Eric Ulrich were honored at HeartShare’s 29th Annual Education Services Dinner Dance at Russo’s on the Bay on Thursday, May 31, 2018. The annual fundraiser, spanning nearly three decades, recognizes individuals who have demonstrated care and concern for the education, wellbeing and development of children. Queens Borough President Katz worked with the HeartShare team to secure a capital construction grant to renovate the Cuomo First Step Early Childhood Center in Richmond Hill, Queens. Council Member Ulrich spoke on behalf of HeartShare at the NYC Council Queens Delegation Meeting in spring 2017, which enabled the school to begin that grant making process. “In a time when government funding is tight and non-profits are fiercely competing for the donor dollar, we need advocates to continue educating our City’s most vulnerable children,” said Carol Verdi, Senior Vice President of HeartShare’s Education Services. Limited funding and regulatory requirements are making early education, especially in the special education field very difficult. Verdi recently detailed those struggles in an episode of HeartShare’s podcast, The Pioneers. 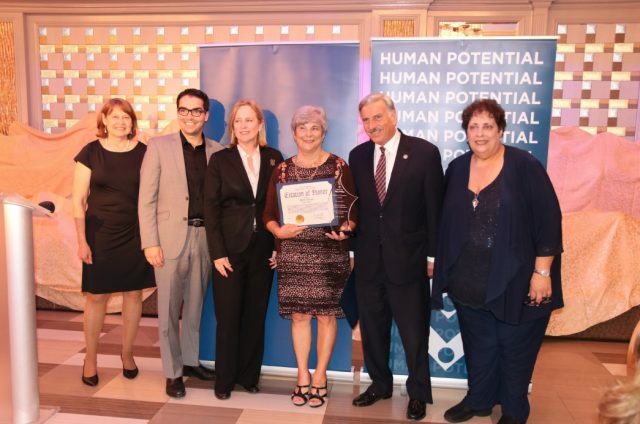 This year, HeartShare also honored Dianne Cattrano, Director of Cuomo First Step Pre-School, as a Children’s Champion. “Dianne was the first director within our education programs to implement a behavioral support curriculum and continued to exceed expectations. Whether it was applying for a KaBOOM! playground or advocating in Albany, Dianne has been tireless in securing resources for her students,” said Linda Tempel, Executive Director for HeartShare’s Developmental Disabilities Services. After 30 years of service to HeartShare, Cattrano will be retiring this year and the award was a welcomed surprise. “I would like to thank my staff for all you do every day to nurture, love and teach our children. You are my heroes!” said Cattrano. Assembly Member David Weprin came out to show his support for HeartShare Education Services and the honorees. For HeartShare’s Annual Toy and Gift Drive, Weprin and his team helps collect and distribute gifts to the children at Cuomo First Step during the holiday season. HeartShare’s First Step Early Childhood Programs in Brooklyn and Queens serve nearly 1,000 students with and without disabilities. HeartShare Pre-K for All classes broadens our service to the community, as well as brings students together and offers early lessons on acceptance and inclusion. In addition to the academic and therapeutic services available at our pre-schools, The HeartShare School, for children ages 5 to 21 diagnosed with autism, is designed to meet the needs of 80 children so they may become as independent as possible and participate fully with their families and in their communities. The event premiered a video story about a student named Julia, who has grown from early childhood to her teenage years at The HeartShare School. “When Julia started here, she wasn’t able to speak. I couldn’t ask the simple question, ‘how was your day?” explained her mother Josephine. With the support of the school, Julia is verbal and showing great potential for independent adulthood. “Julia can do more than I ever thought she would be able to,” her mom added. Generous sponsors of the event included St. Finbar’s Church, Ozone Park Kiwanis Club, Lefferts/Liberty Kiwanis Club, C&C Amusements, EXP Group LLC, Bruno and Tara Frustaci, as well as Bill and Rosanne Koenig. Carol Douglas, also known as “First Lady of the Disco,” provided entertainment for the evening. Learn more about HeartShare’s Education Services here.